Maple flavored frozen dessert with blueberry swirls. 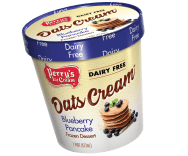 OAT MIX BASE (WATER, OATS), LIQUID SUGAR, BLUEBERRY SWIRL [CORN SYRUP, SUGAR, WATER, BLUEBERRY PUREE CONCENTRATE, MODIFIED CORNSTARCH, CITRIC ACID, FRUIT AND VEGETABLE JUICE (COLOR), NATURAL FLAVOR, GUAR GUM], COCONUT OIL, MAPLE BASE (CORN SYRUP, WATER, SUGAR, CORN STARCH, NATURAL FLAVORS, CARAMEL COLOR, SALT, CITRIC ACID), SOLUBLE CORN FIBER, TAPIOCA SYRUP SOLIDS, SUNFLOWER LECITHIN, CAROB BEAN GUM, GUAR GUM. Coconut Oil is highly refined and therefore not considered an allergen.